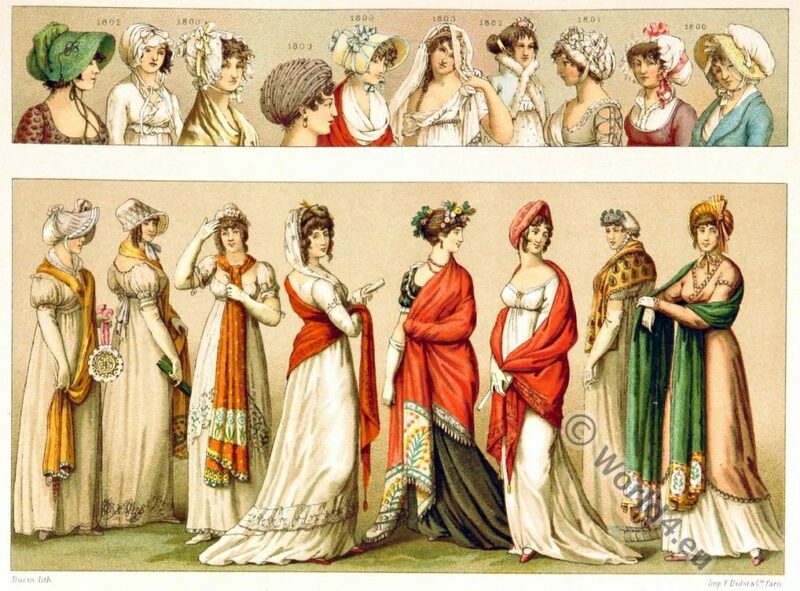 Empire fashion and headgear 1800 to 1810. 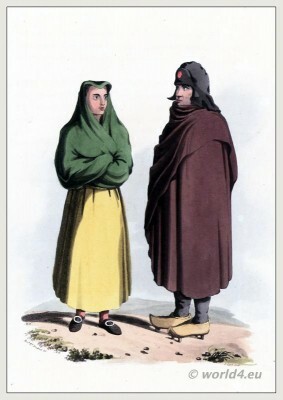 Empire fashion and headgear from 1800 to 1810. This entry was posted in 1800, 1803, 1804, 1805, 1808, 1809, 1810, 19th Century, First Empire, France and tagged First Empire Style on 8/9/16 by world4. Reign of Napoleon I. 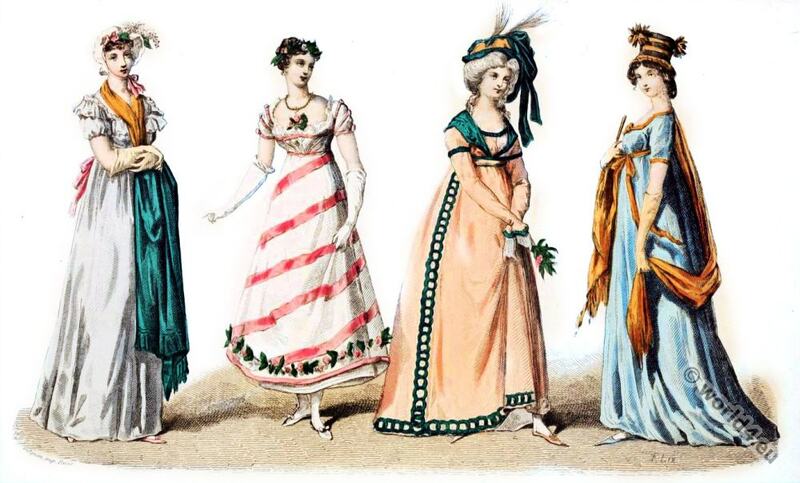 Fashion history. Reign of Napoleon I. 1804 to 1814. This entry was posted in 1800, 1803, 1804, 1805, 1808, 1809, 1810, 1812, 1814, 19th Century, First Empire, France, Georgian period, Regency period and tagged Augustin Challamel, First Empire Style, Regency period on 2/27/15 by world4. Infant Capuchin in monastic garb. 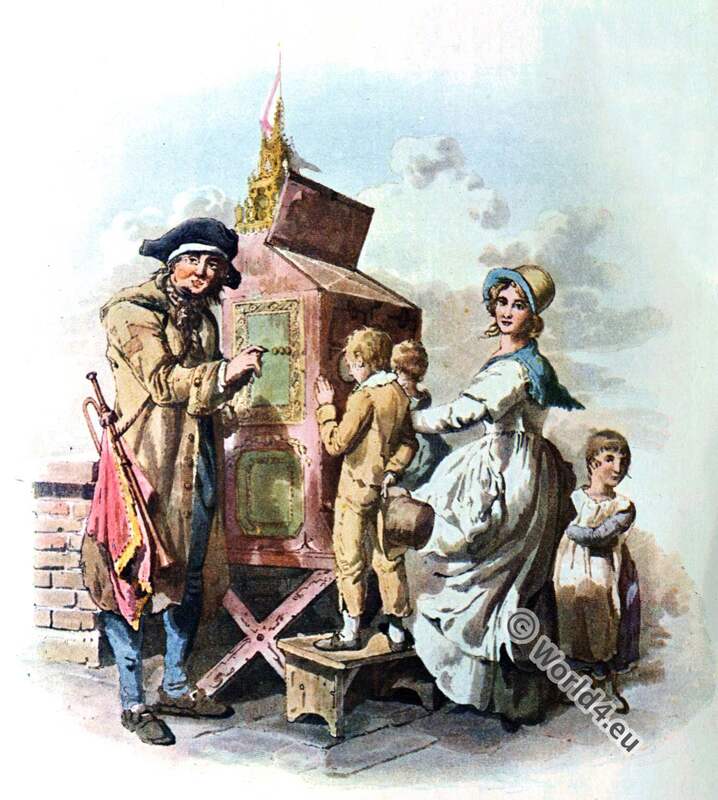 This entry was posted in 1808, 19th Century, Child, Spain, Traditional and tagged Children Costumes, The War in the Peninsula on 7/21/13 by world4. 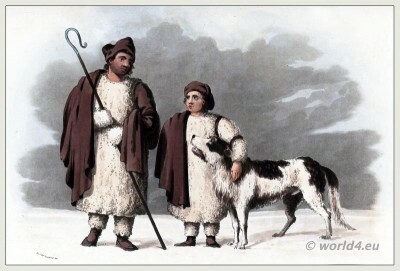 SHEPHERDS OF THE PLAINS OF LEON, In their Winter Clothing. THE dress of the Shepherds here represented, is only worn during the severest days of winter. 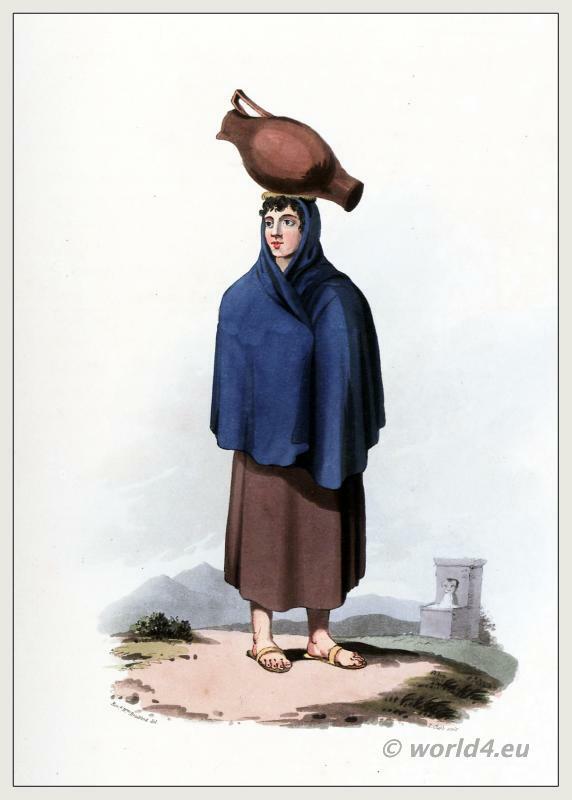 It consists of a sort of sheepskin armour, with the woolly side outwards, over which is thrown a great coat or capa. Thus prepared against inclement weather, the Shepherds are never absent from their flocks, during their winter excursions through the plains, and are always attended by dogs of a peculiarly fine breed, remarkable for their good nature as well as courage. In right of the privileges of the Mesta, (a chartered society of great flock owners, to which the law has granted considerable privileges of pasturage,) the migratory flocks commence their journey about the beginning of November, when the scanty herbage, and cold air of the mountains, render a change of place and climate necessary. The two Castilles, Leon, and Estremadura, are the provinces which have suffered most in their agricultural interests by these annual incursions. 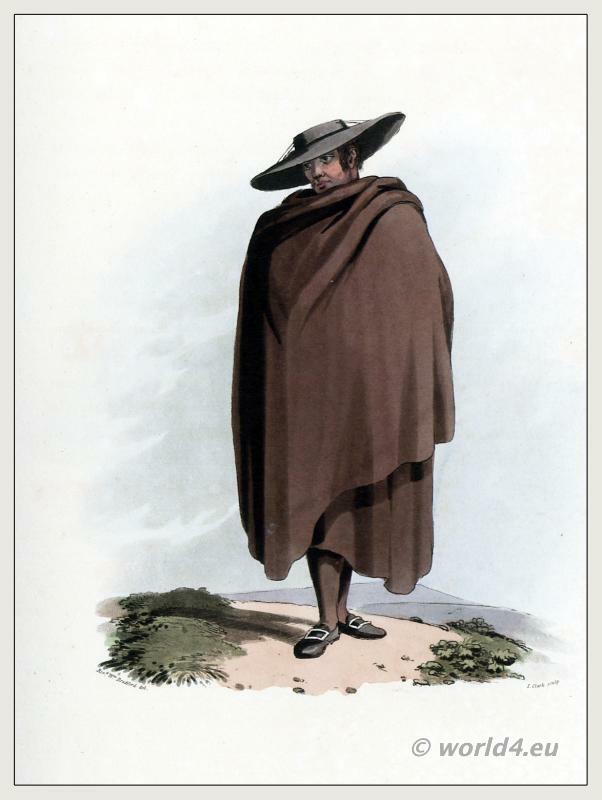 It has been urged by some who profit by this unequal law, that the delicate quality of the Spanish wool is acquired by this change of food and climate, an opinion, wholly refuted by well attested experiments, which prove that the wool of the stationary flocks of Estremadura, is in no degree inferior. Sketches of the country, character, and costume, in Portugal and Spain, made during the campaign, and on the route of the British Army, in 1808 and 1809. This entry was posted in 1808, 19th Century, Spain, Traditional and tagged The War in the Peninsula on 7/21/13 by world4. PEASANTS OF THE CORREGIMIENTO OF TORO. BETWEEN Salamanca and Toro, a variation in dress, and a difference in external character is apparent, which produce a comparison by no means favourable to the peasantry of the latter district. 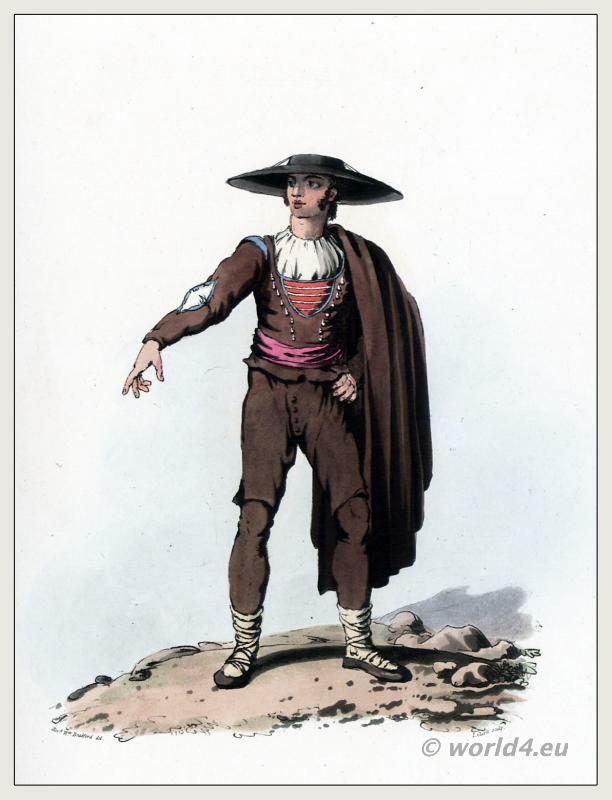 This entry was posted in 1808, 19th Century, Spain, Traditional and tagged The War in the Peninsula, Traditional Spain costumes on 7/21/13 by world4. NOTWITHSTANDING the general gravity of the Spanish character, the dances peculiar to this nation are remarkable for the vivacity of their movements, which people of all ages and conditions delight to indulge in. To the ear of a stranger, there is nothing in the melody or measure of the music, which is calculated to cause such exuberance of action: but to a Spaniard so irresistible is its effect, though not joining in the dance, as to impart an electric influence which sets the whole body in motion. These airs are adapted to the guitar and tambourine, to which the Dancers keep time with castanets. The Fandango and Boleras, each performed by one couple, are the favourite dances. There is also a third, called the Seguidillas, danced by eight persons, something like a Cotillion, but partaking of the graces of the Fandango. When the Fandango is exhibited on the stage, the performers are dres sed in the Andalusian habit: but this sketch represents a Madrilenian and Leonese. 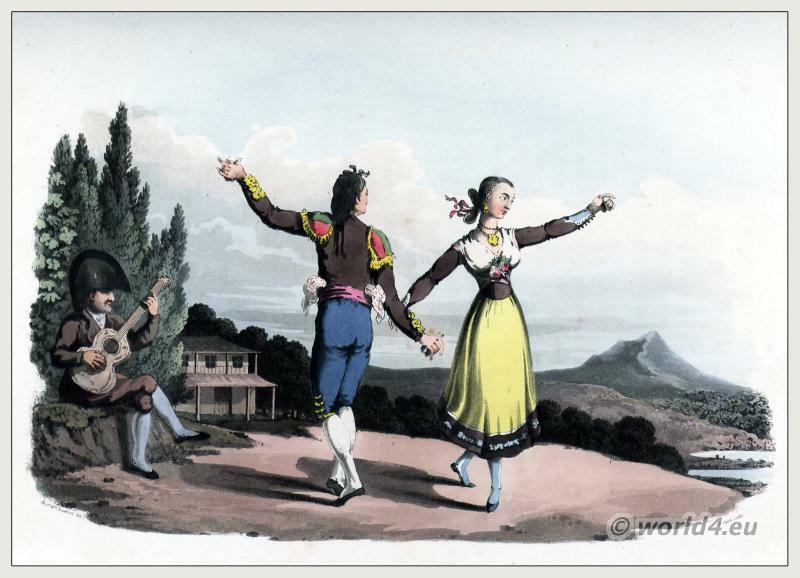 This entry was posted in 1808, 19th Century, Spain, Traditional and tagged Dance costumes, The War in the Peninsula on 7/21/13 by world4. 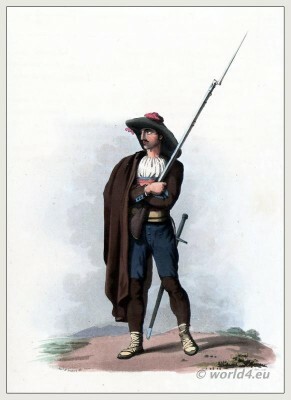 ARMED PEASANT of the Ciudad Rodrigo Militia. CIUDAD Rodrigo is a city in the province of Salamanca, situated on a rising ground, on the north bank of a river running into the Douro, in the midst of a flat open country, rich in corn and pasturage. This city has a handsome cathedral, and is the See of a Bishop. It contains near two thousand houses, well inhabited, and the citizens appear active and intelligent. This entry was posted in 1808, 19th Century, Military, Spain, Traditional and tagged The War in the Peninsula on 7/21/13 by world4. PEASANTS OF THE CORREGIMIENTO OF SALAMANCA. UPON entering the Spanish territories on the road from Almeida to Salamanca, the traveller is struck with the change that appears in the dress and language of the people: but the circumstance most strongly marking a distinction greatly in favour of the Spaniards, is the cleanliness of their dwellings, which generally exhibit a degree of comfort and independence scarcely surpassed by what is seen in the best cottages of England. The costume of the men is dramatic and picturesque, and is well calculated to display a handsome person. It consists of a dark brown jerkin, having a sort of open stomacher, ornamented with curiously wrought buttons of silver, a sash or girdle round the waist, short cloth breeches, reaching half way down the thigh, with stockings of the same materials meeting them, and buskins tied round the feet and ancles with leathern thongs. A large cloak is drawn over the whole person, or worn folded on the shoulder, not without some attention to graceful effect. This fashion is not peculiar to this district on the Frontier, but prevails in the neighbourhood of Salamanca, and through a great part of the kingdom of Leon. 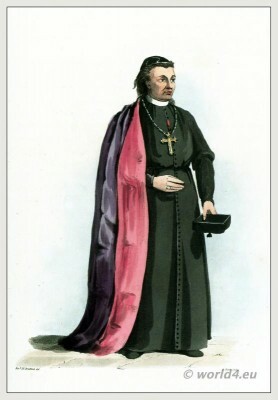 Bishop of Guarda, Portugal 1808. 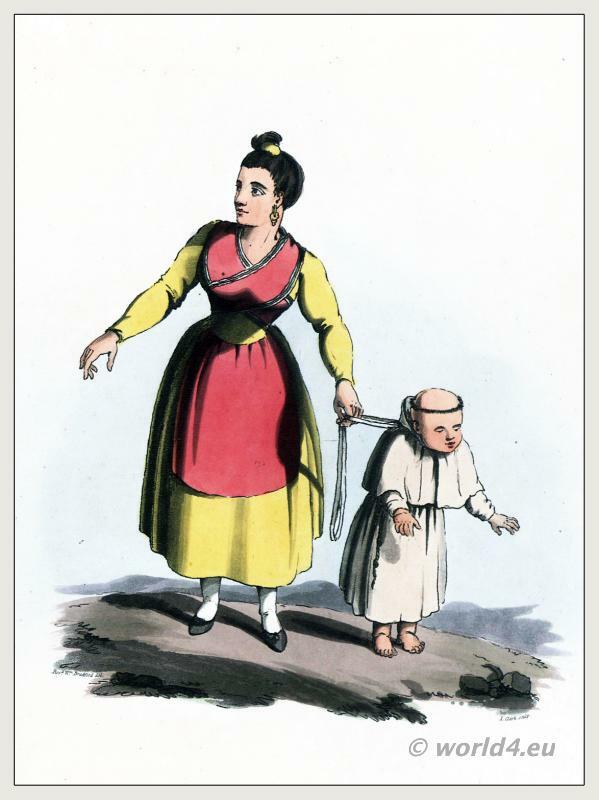 This entry was posted in 1808, 19th Century, Ecclesiastical, Nobility, Portugal and tagged Ecclesiastical Dress, Portuguese costumes, The War in the Peninsula on 7/21/13 by world4. THE approach to Guarda through the valley of saint Anthonio, formed by two parallel branches of the Serra da Estrella is beautiful and romantic. The city is built on the highest of these mountains, and is considered the most elevated situation in Portugal. Its climate is cold and damp, but the salutary effects of the mountain breezes is visible in the blooming countenance and animated character, which distinguish its inhabitants, from those of the plain. There is something singular and picturesque in the appearance of the young women, who are employed in carrying water pitchers to and from the wells. When empty, the pitcher is balanced on the head in the manner represented by the sketch, unsupported by the hands, and without any apparent restraint. Their dress is far from inelegant, and consists of no other colours than brown and blue. They wear no stockings; but their feet are protected by neat sandals. This entry was posted in 1808, 19th Century, Portugal, Traditional and tagged Portuguese costumes, The War in the Peninsula on 7/21/13 by world4.